He's got Boston sports on the brain. By Spencer Buell·	 1/21/2019, 11:46 a.m. The president has some thoughts on Boston sports right now, and he’s sharing them to his 58 million followers on Twitter. First, Trump congratulated the Patriots on their win over the Kansas City Chiefs at the AFC Championship, which will send the team to the Super Bowl. 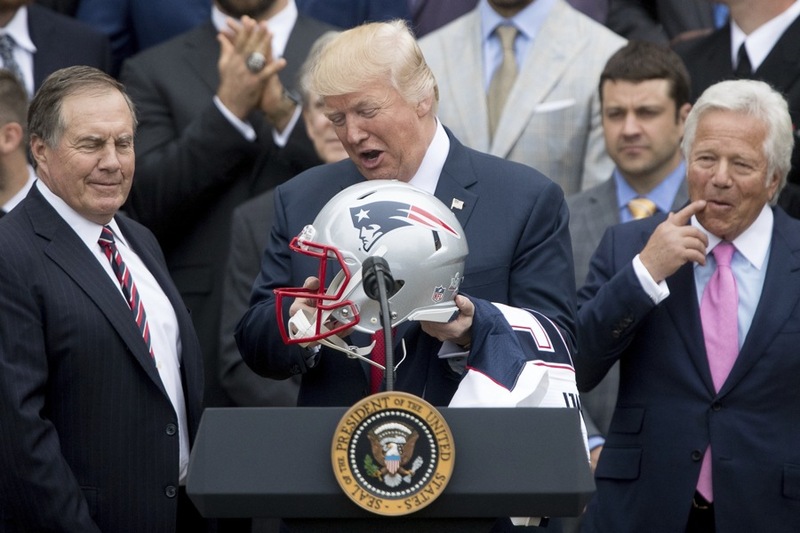 In a tweet, he singled out owner Robert Kraft, coach Bill Belichick, and quarterback Tom Brady, all of whom have links to Trump that are well known. Trump notably did not have anything to say about the Los Angeles Rams, the other team that earned a ticket to the Super Bowl yesterday. Later, Trump had another name in the sports world he wanted to boost with the presidential brand: Curt Schilling. Schilling has chalked his exclusion up to anti-Trump bias, and said he believes if he had shared a tweet reading “Lynch Trump” instead of the one about killing journalists, he would be in the Hall of Fame already. Schilling was a guest on the Fox News show Life, Liberty & Levin on Sunday night, which appears to be what caught the president’s attention. Hall of Fame ballots were due three weeks ago, on December 31. Schilling will need to show up on 75 percent of them to be inducted; last year his total was 51.2 percent.